A lovely George III mahogany pad foot table dating to 1760 to 1780. 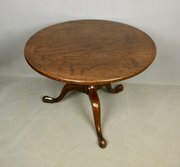 It is now a very convenient height for a coffee table, having been reduced at some time in the 20th Century although we know it has been like this for at least 50 years. It is offered in good condition, commensurate with age, with some age related markings to the top and minor nibbles to the feet, has a good colour and is a practical size at 73.5cm diameter and 49cm high. 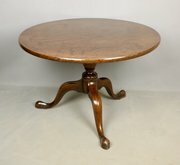 The gun barrel stem is somewhat reduced but it is an attractive table that has a multitude of uses. It does not look out of proportion.